The Australian-bush-plum, Terminalia ferdinandiana, is a small deciduous tree found in northwestern Australia. 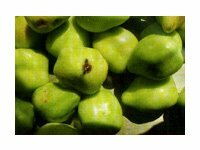 During the wet season extending from January through March, the plant produces small plum-like fruits that look and taste much like gooseberries. These tart, green, heart-shaped fruit that grow from Katherine to the Kimberleys have for many years been a seasonal staple of the local Aboriginal diet. The Australian-bush-plum, also known as the Kakadu or billy goat plum, has been used to treat skin diseases, arthritis, colds and flu. Since scientists discovered the Australian bush plum is in fact a powerhouse of Vitamin C and a great source of antioxidants, the communities of the Kimberley, that grow the Australian-bush-plum are experiencing the 21st Century equivalent of a gold rush. The Gudumul community has been supplying large quantities of these Australian-bush-plums for the manufacture of a range of dietary supplements. Antioxidants provide the key to combating free radical oxidative stress. Antioxidants may also be helpful with other inflammatory issues, fatigue, mental acuity and providing important protection for your skin against damaging ultraviolet radiation from the sun. Try Noni Gia for an easy energy boost - it's loaded with Antioxidants! The most serious threat to human health today is oxidative stress. A common example of oxidative stress is rust. Rust is free radical oxidative stress on metal. The process is similar on human cells. Free radicals are a normal by-product of energy production and the body is designed to cope with this. However, our bodies were designed to live on a pristine planet free of pollution and synthetic chemicals and to eat food that is highly nutritious, fresh and raw, not processed or synthesized. More than 75,000 synthetic chemicals have been added to the Earth’s environment since 1930, and when we add those with other environmental toxins that cause free radical activity to the equation, the level of free radical attack is high enough to cause damage and disease. Free radicals, unchecked, are the principal cause of degenerative diseases as well as premature aging. How do we protect against oxidative stress? The key to combating free radical oxidative stress is antioxidants. Antioxidants may also be helpful with other inflammatory issues, fatigue, mental acuity and important protection for your skin against damaging ultraviolet radiation from the sun. Without question, antioxidants are the single most important defence for your body in the 21st century. Why is healthy food not enough? Doctors and dietitians have been taught that a healthy diet will provide all you need for all aspects of your health. This was true throughout most of history, but our planet has changed and in the 21st century the healthiest diet although desirable is simply no longer enough. Soil mineral conditions, the growing season, time of harvest, and the use of herbicides or plant regulators affect the nutrient of many fresh foods. Supplements are the answer but there is controversy over the effectiveness of supplements, forms, sources, combination and ratios of nutrients. However, the science is clear that natural C and E are superior to synthetics. One of the most valuable re-discoveries of the 21st century, is that of the Australian-bush-plum, known scientifically as Terminalia ferdinandiana. It has been one of the most important resources of the Australian Aborigines and was discovered by the scientific world in 1987 when it was noted that it had more than 50 times more ascorbic acid than citrus fruit. Testing has confirmed it has the highest naturally occurring vitamin C of any known food and that when added to certain other antioxidants and co-factors it makes the best known antioxidant thus far tested in the world. The US Department of Agriculture conducted a study and found that people who consumed up to 10 servings daily of fresh raw fruits and vegetables did increase antioxidant protection up to 13 per cent after only two weeks, as measured by a blood test called serum ORACb-PE. It seems to me - the choice is obvious. In to-day’s world, dietary supplements are no longer a luxury and if you wish to achieve and maintain true wellness you need to be taking quality supplements every day.